"lord, save me from my Ludditism"
Por Dave Rupert, a quem aqueles que lidam com all-things-webdev nos seus nutts and bolts não será estranho. Interrompemos no passado o estado da arte em desenvolvimento web à razão de urgências noutros tópicos, recuperamos em toda a sua extensão este post para recordar/registar o mood entre aqueles que se ocupam do tecido vivo que sustenta o meio. I’ve had a few similar conversations lately with colleagues I admire in the Web industry. They’ve all mentioned that they are a bit tired and burnt out. This happens, especially over time. But there is a trend. For most it comes down to the fact that the etherial World Wide Web, The Medium that we all love, appears broken or unrepairable. It’s hard to divorce the The Medium from the problems of the Physical World. Death. Struggle. Injustice. Politics. This sustained level of IRL civic engagement is tiring, but I will keep my eyes on the prize, hold on. Alas, even the etherial currency created for The Medium is now working to destroy Physical World. One Bitcoin transaction now uses as much energy as your house in a week. If it were me, I’d shut down this experiment. It is immoral. But that’s part of the problem, isn’t it? We’re building things without regard for the ethical implications. Especially, if ignoring the ethical ramificiations happens to create wealth. “Peak capitalism” I guess it’s called. As we yield control over to artificial intelligence and learned machines, I can only hope their trainers considered more than efficiency and capitalism. 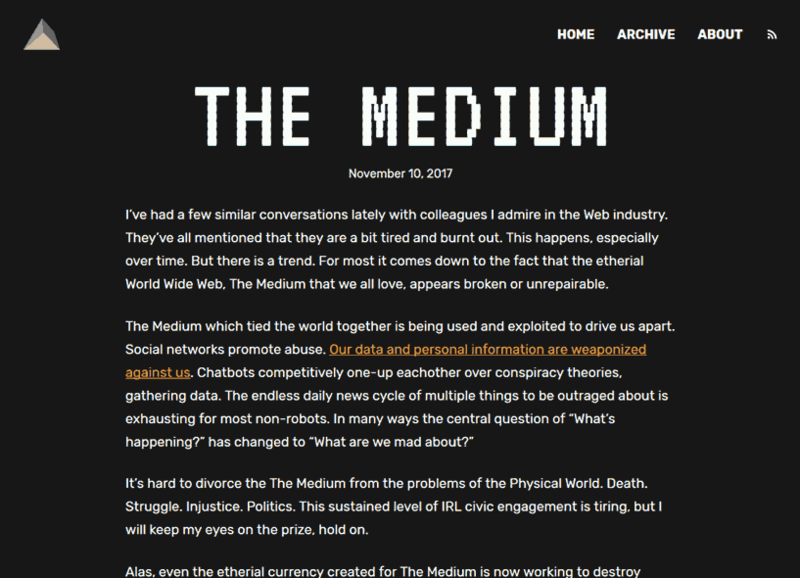 The Medium is slowly being owned by a handful of companies. Reports of the Web’s death are greatly exaggerated, but concentrations of power rarely end up well for the general public. For the physical pixels and bytes delivered to the glowing screens, I have heard specific concerns as well. Recently in a talk about design I heard that “UX is a solved problem.” This particular use of “UX” was in the context of GUIs. That’s a bit deflating and hard to rebut. But maybe in some ways this is a relief, in less than 20 years we’ve managed to upload enough wisdom and shared knowledge into The Medium, that problems are no longer problems. Our knowledge can be automated and we can start thinking about bigger problems. Lord, save me from my Ludditism. I share the disillusionment. This version of The Medium is not The Medium I want or fell in love with. This is a love story about humans connecting across continents. I want to be hopeful even at the risk of being naïve. 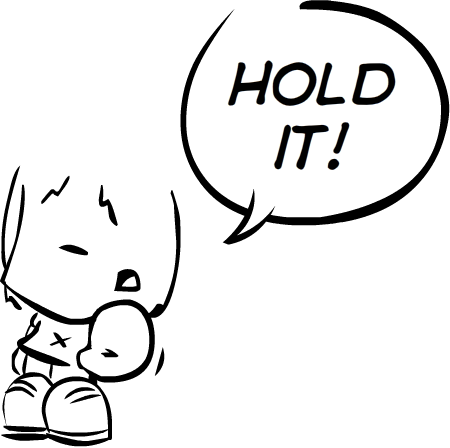 I have to keep reminding myself that I do have some control. I can build The Medium I want. I can cling to what’s good. And this gives me hope. * No qual encontram OS POSITIVOS principalmente ao meio, com ocasionais incursões em fanzines pela última, e raras a caminho das nenhumas na primeira, onde tanta discussão inútil acontece. By social media I mean Twitter, Facebook, Snapchat, et al. 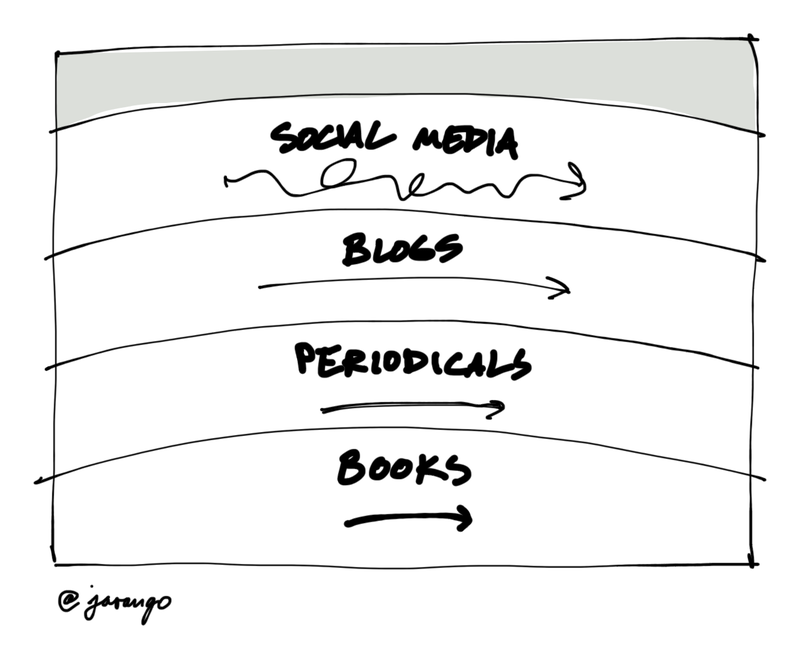 Content is fast, abundant, easy. Ephemeral. By blogs I mean recurrent long(er) form writing published under an individual’s fixed identity so you can get a sense of their commitment to (and understanding of) the ideas. Lots of people do this on Medium these days, although independent blogs (such as this one) still exist. By periodicals I mean magazines, journals, and other venues for recurrent publishing under a branded (group) identity. They have more skin in the game than bloggers, and this gives them more credibility. Think of The New Yorker, The Economist, and Slate. You know what books are. I’m partial to the ones still in active circulation 20+ years after they were first published; that’s the market’s way of filtering out the chaff. Agora definidos, como se processam. Worthwhile ideas make their way down to the the lower layers. As you go down the stack, the signal-to-noise ratio improves. If you’re looking to build your character, the best texts are the ones at the very bottom. Much of the stuff in the top layers is only good for raising your heart rate. Uma definição que podemos complementar em próxima oportunidade.